Here are a list of reasons Pentax believe you should choose a Pentax DSLR. With so many camera brands and styles on the market now picking one that's right for you can be a tricky task. So, to try and help users with their decision Pentax have listed five reasons why a Pentax DSLR could be the camera for you. 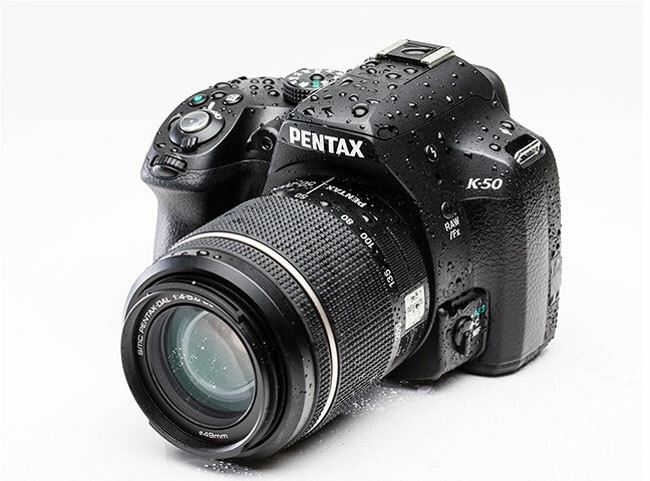 The Pentax digital SLR camera system features weather-resistant, dustproof camera bodies and lenses, which means you'll be able to carry on shooting even if you're caught in a shower and you won't have to constantly worry about your equipment when you're at the beach in the summer. Featured in this range is the Pentax K-3 which has a water resistant body with 92 protection seals. The Pentax range of interchangeable lenses is optimised for an APS-C sensor size so whether you're a telephoto shooter who needs high-magnification, someone who shoots wide vistas or enjoy macro photography, Pentax offers a wide selection of zoom and primes that'll meet your needs. Also, by incorporating the shake-reduction mechanism, once in the camera body, Pentax has removed the weight of lenses by removing the need for an SR system in each lens. Also, by optimising the lens design for APS-C image sensors, weight and size has been further reduced. As the Pentax-developed SR (shake reduction) mechanism is now found in Pentax SLR camera bodies, the effect of camera shake is minimised effectively and with all compatible interchangeable lenses. Further more, the Pentax entry-class models are equipped with a pentaprism viewfinder, in place of a pentamirror viewfinder commonly used for the entry class models. As a result, a larger, brighter image for quick, effortless confirmation of image composition is produced. Certain models found in the Pentax DSLR range can be customised with colour. Choose from over 100 colour combinations to make your camera unique. Before purchase, photographers can colour coordinate the body and grip with their favorite colours, in fact on the Ricoh website users can use a colour simulator to change the colour of a Pentax K-50. And your telling us this because??!!! "I carry a camera to capture memories and the occasional photograph worthy of sharing"
No.5: It's not widely advertised on tv, thus the "fashionistas" all opt for Nikon and Canon, leaving Pentax to people who appreciate real quality!! They had me up to 3. But seriously, am I that concerned about the colour of the camera? 2) Amazing low light performance. 3) High resolution full-frame quality to rival medium format cameras. 4) Small and light-weight camera bodies. 5) Quality lenses that don't cost an arm and a leg. Didn't they need to post that article on the Canon website? Preaching to the church mice here... Even when, for a couple of years, I sold ALL of my kit and had no reason to go back to Pentax, I still did. How about these 6 reasons to buy Pentax? 2. It's not Canon. Cheap and nasty. For people who think it makes them look like a photographer. 3. It's not Minolta. What? 4. It's not Olympus. Who? 5. It's not Sony. Don't they make over priced tellys? I agree. The K5 is superb. I admit to be sorely tempted to jump ship and buy a Nikon Df but having just read the review of it in this week's AP it is slightly disappointing from a price/performance point of view. Now, if Pentax could be tempted to emulate the traditional SLR idea with a "digital LX......." then I could definitely be tempted! For me it's the image quality compared, features for the price, control/menu layout, compatibility with legacy lenses including the inherent stabilisation of them also, along with the sturdiness of the bodies. Of a side note is the compactness of both bodies and lenses. This has flow on affects, in the likes of use on smaller tripods when travelling etc, which is not something I'd ever considered initially! I have a nearly new K5,and it focusses almost instantaneously as it is,and is quick enough for me,so I don't see the point of moving over to a K5ii. The live view on the newer camera is the same,and the rear LCD is on my K5 is as good,or better,than any of he other cameras I've had,and overall my K5,fitted with the additional battery pack accessory,for even better handling,is a great,solidly built piece of kit,capable of outperforming several higher priced cameras from other makers. As regards lenses,the only lenses I have are the standard 18-55 kit zoom,plus a Samsung D-Zenon 50-200,(made in the same factory as the Pentax equivalent,but of a slightly higher standard),an old Pentax SMC 50mm f2 manual focus lens,and a Tokina autofocus 28-70 PK-A zoom. These lenses are plenty sharp enough,and can handle most things,and there's plenty of K fitting second hand lenses out there if you can't afford a new Pentax lens for your kit. I started in "proper picture making" a while ago, started off with Canon, for no better reason than there was a good deal at the multiple box seller. I bought more lenses and bits and pieces and upgraded my Canon, wasn't fully happy with what it did and how it did it. Saw reviews on Pentax, didn't want gaudy colours so bought a K3 with 2 lenses. What a revelation, a much nicer camera, very capable yet easy to use, suits me perfectly, it is my camera of choice, I have a Sony A6000, awkward to use in my opinion. If I can use my Canon lenses on the Pentax, my world would be almost perfect. There are more reasons to believe in it and I guess that when I'll be working on assignment help websites, I'll have everything that I need at once. It will be the best of all the things that I'm having right now for sure.